When I taste something that surprises me, the world feels new for a moment, full of possibility and wonder and hope. That feeling is so important, yet paradoxically, the more time I spend trying new cocktails, the less often it occurs. Happily though, this magic visited me twice in my trip to True Laurel, and in talking to head bartender Nicolas Torres, I’m sure that he’ll bring that feeling again and again. True Laurel is the sister spot to Lazy Bear, a San Francisco restaurant featuring all the virtuosity its two Michelin stars imply without the stuffiness that so often suffuses establishments of this caliber. The “California Cuisine” model is in full effect here; chefs start with foraging trips and visits to the farmer’s market, then use a combination of technical mastery and prodigious creativity to summon dishes that surprise and delight with the freshness of their approach. Nick is applying the same principles to his cocktail program at True Laurel, and while you don’t need a conversation with him to appreciate what’s happening in the glass, talking with him opened my mind to new ways of thinking about how one can marry flavors together so that they transform each other into something new. True to its name, this house-fermented sparkler was the highlight of my visit. 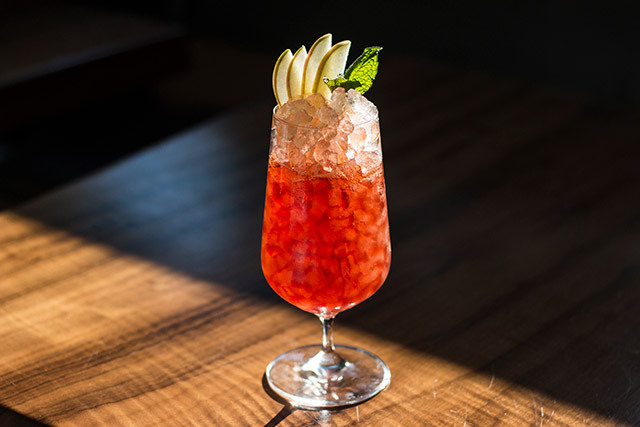 The flavors in the drink (tonic, cider and rancio wine) could easily be combined by popping open a few bottles and pouring them into a highball glass, but if you did that, they wouldn’t come close to the level of depth this cocktail achieves. To create it, the True Laurel team brews their own cider, then uses secondary fermentation in bottle to bind the component ingredients through the wondrous effects of yeast. As a result I can’t tell where one ends and the next begins. It’s this level of dedication that gets me so excited about True Laurel. These processes are time-consuming and difficult to control. Nick admitted that every batch is a little bit different. 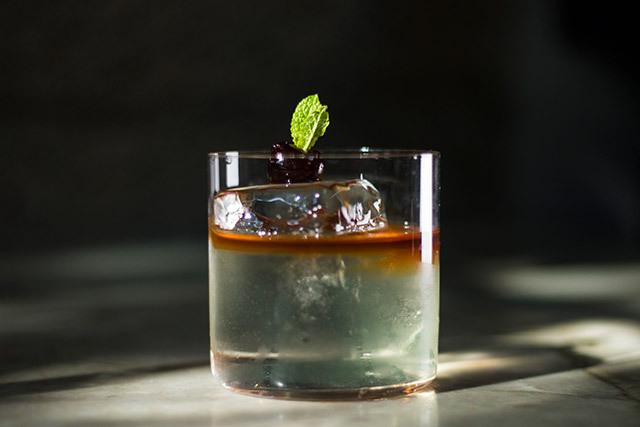 The drink is a living thing and the flavors will change slightly each time you return as variances in temperature, humidity and seasonal ingredients all make their mark on the final product. Without a doubt, this is the most complex vodka cocktail I’ve ever had. Nick compared the thinking behind it to a chef creating a soup. In addition to the standard cocktail elements (sweet, sour, aromatic) he has added salt and umami. 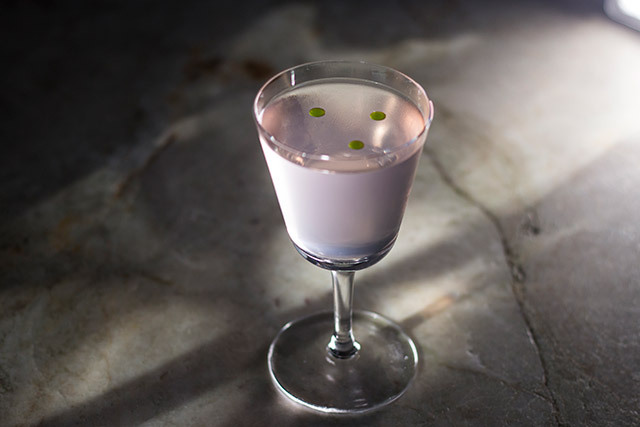 The presentation is as beguiling as the drink itself, a soft fuchsia hue setting off three luminescent drops of green shiso oil. The flavor ping-pongs rapidly between savory and tangy. My taste buds never knew where to land, which kept me reaching for my glass trying to catch an impression that would not stand still. I took one sip of this and decided it should be a modern classic. 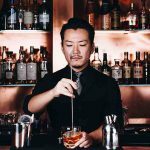 The combination is so simple, balanced and delicious that bartenders coast to coast could riff on it endlessly, coming up aces every time. It showcases some heavy-hitting fortified wines with the grenadine adding a welcome tang and the Angostura bringing the complexity. The cobbled ice is perfect here, both taking the edge off of the bitters and creating an endlessly cold quencher that’s easy to sip all the way down. 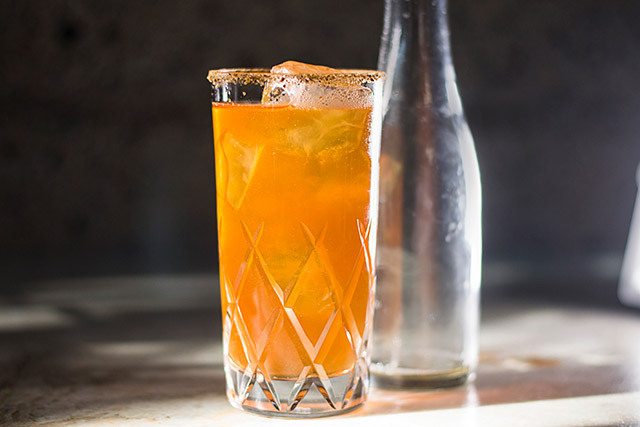 Nick is well-versed in the classics, and this drink is an inspired riff on the Martinez. 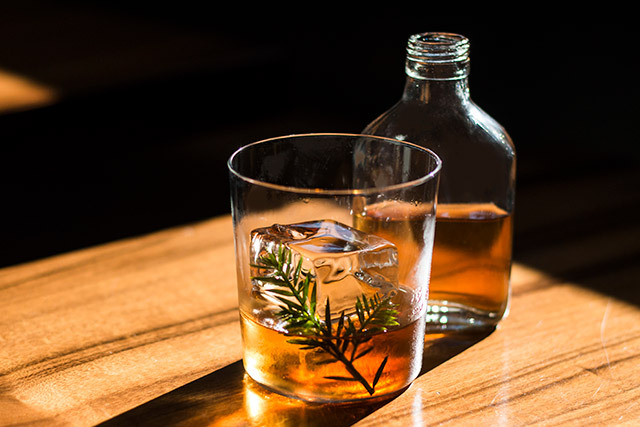 With a gin as evergreen-forward as St. George’s Terroir, you wouldn’t think more coniferous would be necessary, but the freshness of the pine tips is a nice touch. My only wish is that I could have tasted more of the coconut. I thought that was a lovely way to add some softness to all the assertive herbal flavors at play here. I didn’t love every drink I had at True Laurel, but that’s the case at any bar. The coffee rum float in the Mai O Mai didn’t quite mesh with the Mai Tai inspired milk punch below it. 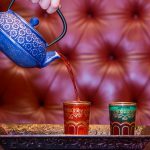 But the opening scent of mint and java got me thinking about Turkish coffee, which is one hell of a fun way to introduce a tiki drink. I have a friend who loves this drink, for whatever reason it just didn’t click for me. I thought its presentation was impeccable, however, down to the divot in the clear ice cube that perfectly cradles a cocktail cherry festooned with a sprig of mint. Cocktails at True Laurel are rotated as the produce that inspires them goes out of season, so you’re bound to find something new every time you go. 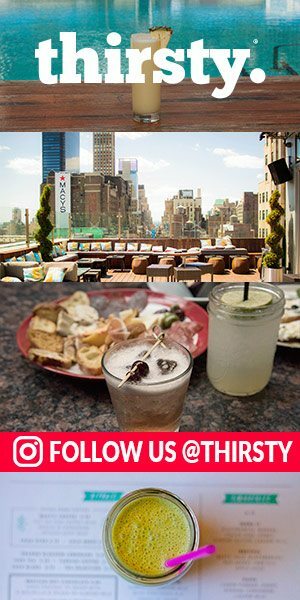 Nick’s culinary background gives these drinks a dimensionality that works well with food and the restaurant has a full suite of fun, tasty bites. I will certainly be back, and I hope a few of the drinks I didn’t get to try are still on the menu. I’m excited to see what Nick does next. Bars like True Laurel are pushing the bartender’s art into uncharted territory. I thrill to think what new wonders they’ll discover.